In Gerga, a small town that lies on the fertile banks of the Nile in Upper Egypt and in the 1940s, Yassa and Genevieve gave birth to their beautiful eldest daughter Fawzia. Ever since her birth, she was a chosen fruit, and her mission was clearly assigned: “She is not yours; she is ours, but look after her and bring her up properly” were the words of the Virgin Mary to her mother in a vision while in labour. In her younger days she showed a passionate interest in monastic life and in her early teens she joined the convent of Saint Philopater Mercurius (Abu Seifein) in “Old Cairo” and was named Irene. In Octobor 1962, after the departure of the mother superior of the convent, Irene, the youngest of all the nuns, was pushed to church to be ordained as the new mother superior, Tamav Irene; that is when His Holiness Pope Kyrillos VI held the chair of the See of St. Mark. So exceptional was this nun in his eyes that he entrusted her to be the abbess of the convent. In her, he recognized the exemplary reflection of God's Love and Holiness and the profound ascetic self-discipline that she exercised in her monastic life. Tamav Irene lived a life full of spiritual depth. She lived a life that is unparalleled in our modern times. 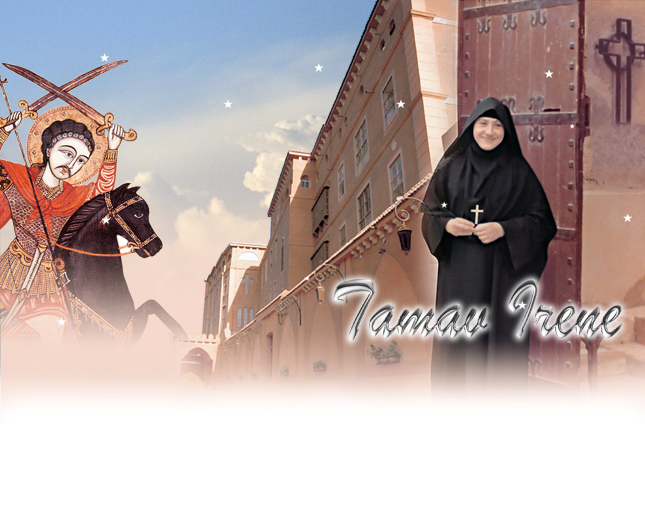 This great saint departed to her heavenly abode on October 31st, 2006 after forty-four years of service as the mother superior of the convent of St. Philopater Mercurius in “Old Cairo”, Cairo, Egypt. There is so much to say about her and this site is dedicated to tell you all about her.